Had a wonderful day tour guide really made it!! Great day tour, plenty of time in Ronda, which is a great little town. Had a fantastic cheap lunch which was recommended by our guide. The Ronda tour was wonderful and even included a tour of downtown Marbella. Our tour guide was knowledgable and informative. The town is lovely. 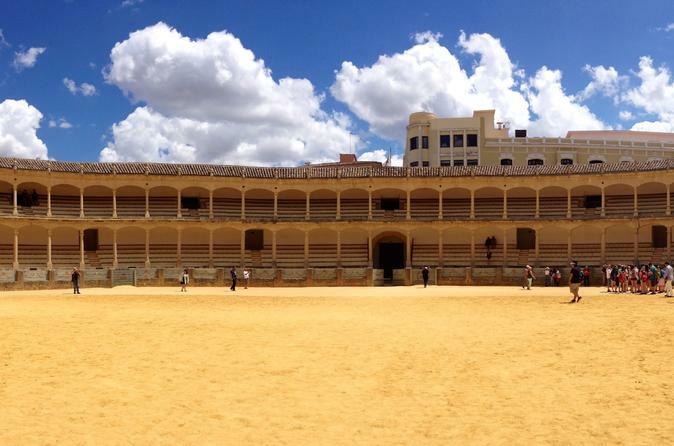 We were fortunate to be there on a bullfight day. Very difficult to understand our guide as he didn't speak English very well and had to repeat in 4 different languages. Difficult to hear with all the surrounding noise. Many bad issues with this tour. 1 Tour guide did not care whether customer hear him well or not. There are a whole bus full - at least 40 people in the tour, and no whisper audilogy equipment., spoke with a normal tone. Guide talked like a machine. The minute he stops at a point, don't care whether all people are there or not, he start talking, so if people are arriving at the end will miss 40 or more of what the explanation of the site. 40 people walking in a narrow streets - it is naturally half of them need time to gather around him. Even when I was so close to him at times I can' t hear him, because he stop on the site of a busy road with the noise of the cars. I signed up for a 6 hour tour, but this takes 12 hours, just because pick up every single people on the way to ROnda, it took almost 4 hours in the bus before we reach Ronda supposed to be only 90 min, same as going back.I would not have wasted so much time in this kind of tour - worth paying more for private tour. Tour was OK. Guide was short and did not have a flag to help follow him. He spoke several different languages all with a fast Spanish accent. Ronda was far more crowded than I expected. Rondo itself is a lovely city with fantastic views of the gorge. Its streets are narrow and crowded during the tour hours, but everyone manages. There are many unique shops and restaurants. Specialty shops include leather, pottery, linens and fancy fans. And all things related to bull fighting! Our recent visit was made less enjoyable by a guide who kept repeating himself over and over land could not be easily understood when he switched to English. I don't think he even introduced himself. The wine tasting tour was a disappointment, as there was just a little room with pictures on the wall, taps on the wall where you could get a glass or two of different wines but no one to talk about the wines or the region. The guide was actually silent during this tour. And to think that there was a fee to get in! Wonderful day out, The scenery and the gorge are breathtaking. Our guide Paco was informative and very attentive. 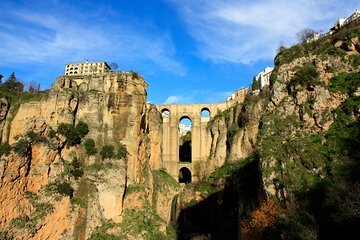 Nice trip to Ronda. A bit to long break for toilet / coffee at the break station. We got an older sarcastic/ funny guide who taught us his life wisdom.